Exquisite home in Towns Walk Subdivision off Timothy Road in Athens. The gorgeous brick/stone combination and the inviting covered porch make for a great first impression of this home. As you enter you will find a dining room to the right with great trim & wood floors. As you continue you will find the great open floor plan Kitchen/Family Room. The kitchen features wood cabinets, granite counter tops, island & stainless steel appliances. The kitchen overlooks the breakfast area and spacious family room with vaulted ceiling. Wood floors throughout main living areas. The large master bedroom is located on the main level and has trey ceiling & spacious en-suite bathroom with separate tub/shower and double vanity. Large closets throughout. There is an additional bedroom on the main with a full bathroom. Upstairs you will find 3 large bedrooms, two with vaulted ceilings & a spacious media room which is fully equip with all the bells and whistles. There is a patio in the backyard. A MUST SEE!! Seller needs possession until September 15, 2016. 261 Towns Walk Drive, Athens GA 30606 is a Home, with 5 bedrooms which is recently sold, it has 3,133 sqft, 0.0 - 0.25 sized lot, and Attached,Garage parking. 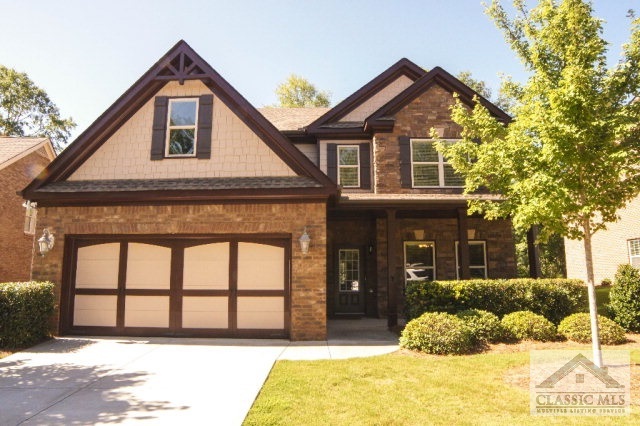 A comparable Home, has 3 bedrooms and 3 baths, it was built in and is located at 229 Township Lane Athens GA 30606 and for sale by its owner at $ 314,900. This home is located in the city of Athens , in zip code 30606, this Clarke County Home, it is in the Towns Walk Subdivision, and Bedgood Glenwood are nearby neighborhoods.